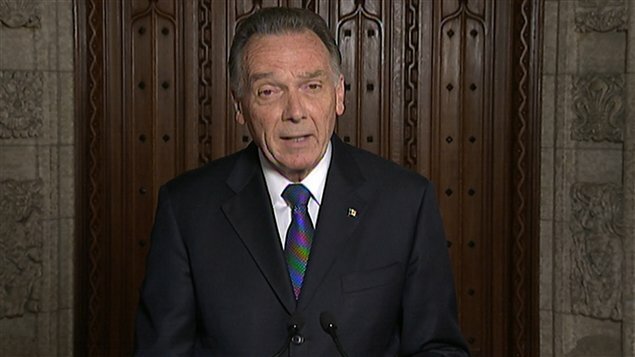 Canadian minister of the environment Peter Kent (photo, from radio-canada.ca) has announced that his country will formally withdraw from the Kyoto Protocol on climate change initially adopted in Japan in 1997. Canada will be the first country to pull out of the global treaty, a move which was expected and is legal. The protocol “does not represent a way forward for Canada”, said Mr Kent. “Kyoto, for Canada, is in the past, and as such we are invoking our legal right to withdraw from Kyoto,” he said in Toronto. He added that he will be formally advising the United Nations of Canada’s intention to withdraw. If it did not pull out, Canada would have to pay crippling fines for failing to meet its targets. Mr Kent said the cost of meeting Canada’s obligations under Kyoto would be $13.6bn (10.3bn euros). “That’s $1,600 from every Canadian family – that’s the Kyoto cost to Canadians, that was the legacy of an incompetent Liberal government”. “We believe that a new agreement that will allow us to generate jobs and economic growth represents the way forward,” Mr Kent said. China criticised Canada’s decision, according to Chinese foreign ministry spokesman Liu Weimin it went “against the efforts of the international community and is regrettable”. “We hope Canada will face up to its responsibilities and obligations, honour its commitments and actively participate in relevant international co-operation against climate change,” he added. Beijing says because it is a developing nation it should be exempt from emissions reduction targets. The Canadian government is abdicating its international responsibilities according to Megan Leslie, environment spokesperson for the country’s opposition New Democratic Party. “We all knew the rumours. We all heard the reports that Canada planned to withdraw from Kyoto, and so today we actually saw it laid out before us,” she said. The Kyoto Protocol was signed by Canada’s previous Liberal government. In 2006 the Conservative government took power and made clear that it did not intend to meet the country’s Kyoto commitments. Under the Kyoto accord, Canada had to cut emissions to six per cent below 1990 levels by 2012, but by 2009 emissions were 17 per cent above the 1990 levels. Hours before Mr Kent’s announcement, a last-minute deal on climate change was agreed in Durban, South Africa. The UN climate conference decided that talks on a new legal deal covering all countries will be held between 2012 and 2015, coming into effect by 2020. Although Canada backs a new global deal to cut emissions of greenhouse gases, it claims that all nations should be concerned by it, including China and India which are not bound by Kyoto’s current targets. India wants to maintain the current division where only countries labelled “developed” have to cut their greenhouse gas emissions.